Money is something on many people’s minds right now, especially given the financial problems that the country as a whole is facing. Individuals must budget more strictly than ever before in order to stay on top of their finances. Cutting back on spending is becoming the norm to ensure that people’s hard-earned cash goes that bit further. One way to ease your money worries is to use your credit card to your advantage and make use of all the benefits that are on offer, allowing you to put your finances to the back of your mind. If you use your credit card correctly then you can ease a lot of your money worries and enjoy a certain amount of financial freedom. You can take advantage of the deals that are available, including interest free credit cards, so that you can keep your debt at a manageable level. Offers such as getting zero per cent on all purchases you make with your credit card for six months can enable you to buy something now and pay for it later, while being safe in the knowledge it won’t cost you a penny extra. Credit cards are perfect for making expensive purchases that you wouldn’t otherwise be able to afford. Buying a brand new, flat-screen TV for example can be made possible by knowing that you can pay for it over a period time. You may not have the cash to hand to pay for it all at once, but with a series of monthly payments you will be more than able to cover it. This will allow you to get the TV right away and enjoy watching footy on the big screen, while paying for it at a later date. A credit card can be extremely useful, but when used the wrong way will hit your long term finances hard. If you start using your credit card left, right and centre because you don’t have any cash, make sure you know that when you get paid at the end of the month you’ll be able to cover your purchases. Whichever credit card you choose and however good the deal is, it is essential that you make your repayments on time. If you’re late with your credit card payments, the level of your debt will start to soar. Just how much it will increase will depend on the annual percentage rate (APR) of your card. The higher the APR, the more interest you’ll have to pay on the money you owe, so make sure you keep this to as low a level as possible. The APR will depend on the card you select. Credit cards with longer interest-free periods tend to have higher APRs, something worth bearing in mind when you’re casting your eye over the deals available. Alongside the APR, the important figures to keep in mind are the length of time in which you can enjoy zero per cent on balance transfers and card purchases. You can compare these figures online from the comfort of your own home and as a result be well-placed to apply for the card that’s right for you. Different credit cards offer different rewards for their customers, ranging from money off certain purchases to benefits such as air miles. 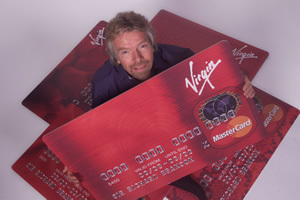 There are credit cards available for example that give you one air mile for every pound that you spend on your card. This is particularly useful if you’re a frequent flyer, and if you use your credit card regularly you’ll soon have accumulated a fair few points. Using your credit card can also be an ethical choice as you can decide to donate to a charity of your choice whenever you spend money on it. Charity credit cards, as they are known, involve money being given to charity when you use your card. For example, for every £100 you spend, £1 may be given to charity and with a fair few charitable organisations to choose from, you can help support the cause that means the most to you. Once you’ve chosen your ideal credit card, you can apply for it online and then wait to be accepted. If you are, you can then enjoy the benefits the credit card offers you while always having in the back of your mind how important it is to be responsible in how you use your piece of plastic. Many credit card companies give you the option to manage your account online, so you really have no excuse not to stay on top of your finances. Not only does this allow you to be in full control of your balance, but due to paperless statements you’re doing your little bit for the environment, too. You may be slightly overwhelmed by the choice you’re given when getting a new credit card, but as long as you apply for one that offers you good rates and great benefits then you should be heading along the right track. Just make sure that if you’re approved for a new card, you use it responsibly and don’t become yet another person to build up levels of debt that are simply unmanageable. How Secure Is Your Credit Card On Your Phone?